Since 1968, when her parents founded their goat dairy "Redwood Hill Farm" in Sonoma County, Jennifer Bice has been intimately involved in raising, milking, and making Certified Humane goat cheese. 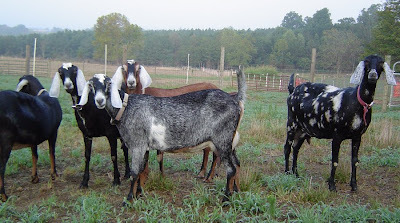 Located in warm and verdant Sebastopol, Jennifer's herds of Nubian, Alpine, Saanen, and LaMancha goats clamber around green pastures when the weather is fine but, are kept snugly inside when the winds and rains buck up. 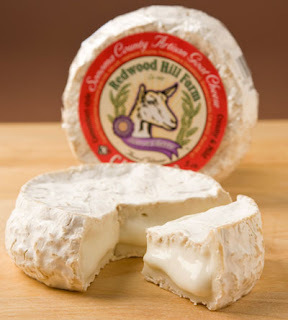 Named after one of their favorite does, Camellia is a luscious, Camembert-style goat milk cheese. It has a mild, buttery flavor and firm texture when young, becoming softer and more complex with age. The white, edible penicillum candidum rind ripens the cheese from the outside inwards, becoming fully ripe when the center is soft to the touch (like a ripe peach). This usually takes 5-6 weeks, though the cheese is delicious at any age.